This Amarilla Golf apartment rental is situated on the Fairways complex. It is south facing with a large terrace. There is also air conditioning. We have just returned from a fabulous holiday on the Fairways Club. We booked through RCI this time, but there are privately owned apartments on this complex as well. I will definitely try to book one of those next time. We met a couple around the pool who had rented one from a private owner. They very kindly showed us around. It was just like a home from home. It even had a washing machine and air conditioning. They told us they booked through Karen Durant from Holidays 4U. We found the staff on the complex to be very helpful and friendly. The pool and surrounding sun terraces are very well maintained. There is also a pool bar which serves food and drinks throughout the day. And there is also a restaurant on site, which we ate in on a couple of evenings. The good was of a very good quality and I would highly recommend it. I think it was called the Fusion Restaurant. As we booked the apartment on a self catering basis, the supermarket across the road was quite handy. It is around a 10 minute taxi ride to San Blas where there is a bigger supermarket and other shops, as well as plenty of restaurants. We did this few nights as well, as it was nice to get a bigger choice of restaurants. It only cost around 5 euros each way in the taxi, so well worth it. The little fishing village of Los Abrigos is also nearby and a definite must do. It is very quaint with a range of tempting fish restaurants. 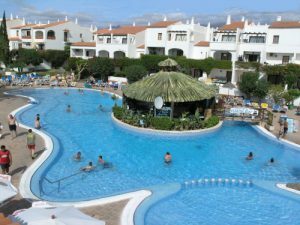 This entry was posted in Tenerife Apartments and tagged #amarillagolf, #holidays4uorg, #karendurant, #tenerifeapartments by holidays4u. Bookmark the permalink.